Netflix has confirmed there'll be a second season of the Duffer brothers pop culture phenomenon: Stranger Things. The second season announcement teaser trailer outlines enigmatic episode titles. These title chapters are Madmax, The Boy Who Came Back to Life, The Pumpkin Patch, The Palace, The Storm, The Pollywog, The Secret Cabin, The Brain, and The Lost Brother. Stranger Things has resonated deeply with audiences in an era of nihilistic Hollywood blockbusters. Its use of mythological storytelling harkens back to Steven Spielberg and George Lucas. "We wanted to feel like a big movie, so we wanted to solve that main tension of where Will went and what happened to him," Matt Duffer told press earlier this summer. "But then there's the bigger mythology behind what happened, so there's definitely a lot of dangling threads at the end… if people wanted it and Netflix wanted it, we could explore it and continue the storyline." The second season will be set in 1984, a year after events in season one, and comprise of nine episodes when it premieres in 2017. 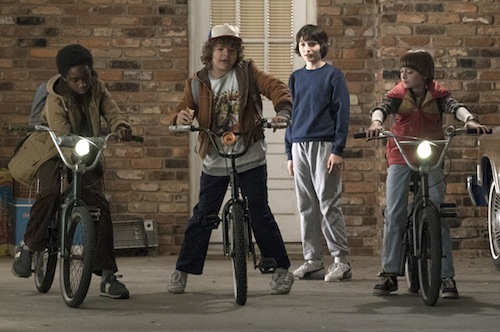 Whilst no official cast has been announced, you can expect the return of Ryder, Wolfhard, Matarazzo and the rest of the gang... but maybe not Brown's Eleven. Yes, you read that right. "We don't know about Eleven," Ross Duffer told Entertainment Weekly. "We leave that up in the air." How very dare they! The Duffer brothers have alluded to the seminal sequels of James Cameron as an influence on the second season. Guys, you've got my attention. Excited about returning to Upside Down? Let me know in the comments below.